I might be late to his party, but I am going to party it up to make up for lost time! The party I’m referring to? Salad in Jar. I must confess, I don’t actually like salad all that terribly much. Say what you want, but making a peanut-butter sandwich or grabbing some cheese and crackers is a much speedier lunch for me when I’m working, rather than going through all the washing, peeling and chopping to make a salad. And then, there’s always a tinge of dissatisfaction when I’m done eating a salad. And I’m often hungry again a couple hours later. In order for me to really enjoy a salad and feel satisfied by it, it needs to have protein (to last me longer), texture, and sweetness. It needs to be complex. Hearty. A pile of lettuce with a few shredded veg on top ain’t gonna cut it. The solution to all my dilemmas exists in 4 words: Salad in a Jar. Now, Salad in a Jar is the Pinterest phenomenon that’s been around for at least a couple of years. But for some reason (probably because I’m not turned on by salads), I never tried one until a couple of weeks ago. But now I’m hooked. It answers all my problems: issues of time, money, satisfaction, and healthy eating can all be solved by Salad in a Jar. Here’s how: you book some time on Sunday (it’ll probably take you less than an hour), and put together five of these things for the week. Then, they just live in the fridge, and every day, on your way out the door, you grab one. You have two options: you can pour your salad into a large bowl at work, or you can shake the bejesus out of it in the jar (to distribute the dressing) and eat it straight from the jar. Either one works, although the bowl option is more elegant and easier to eat, while the straight-from-the-jar option is more convenient, as you can eat it anywhere. It’s entirely up to you. Here’s how to build the ultimate Salad in a Jar. Lettuce: I like romaine or green leaf. Iceberg… not so much ($1.29). Vegetables: whatever you like. You get to decide. I like carrots ($1.99), cucumbers ($1.29), sweet grape tomatoes ($2), and sugar snap peas ($1.67). Grains: grains are awesome to add to your salad for texture, but also for some much-needed B-vitamins and for extra fibre. You can use cooked quinoa (about $5/bag), barley (less than $2/bag), buckwheat groats, or bulgur. Any of these is likely available in bulk quite inexpensively, a week’s worth should only cost you about $2-3. Protein: I need protein! A salad alone won’t keep me going. I like to add hard-boiled eggs ($1.89 for 1/2 dozen), some canned tuna ($.99), canned chickpeas ($.89), or even leftover cooked chicken or shrimp. Something sweet: I like fruit in mine to give the salad a sweetness. You can either use a dried fruit, like apricots, dates, cranberries or raisins ($2-4/per package), or fresh, seasonal fruit, like sliced strawberries, blueberries, raspberries, figs, or peaches (which are all selling for $2-3 per package right now). Something crunchy: while the vegetables themselves certainly have a crunch, I like nuts or something to give my salad a textural component. You could use any kind of nuts or seeds, lightly toasted, or tortilla chips (bought or homemade). Roasted chickpeas would also be good. While nuts can be expensive, seeds, like pumpkin can be bought for less than $2/per bag, or you can simply buy at a bulk store, and pay less than $5. Cheese. Yeah. I need cheese. The end. It adds both protein and creamy mouth-feel. You should be able to get enough cheese for a week’s worth for $3-5. If you’re careful, you should be able to purchase all the ingredients you need for your week’s worth of salads for $20. That’s $4 per lunch! Awesome. When it comes to jars, you have a few options. I like the 1 litre Bernardin Wide Mouth Jars. You can buy a dozen for $13.99 at Canadian Tire, or you can try your luck at the Sally Ann or Value Village. Another option is Dollar Stores. I saw some cute 750 ml wide-mouth snap-top glass jars at my local Dollar Tree for $1.50 each. What’s important is that it’s big enough to hold a hearty salad, and has a tight-fitting lid. 1. Start by doing any cooking or toasting you need to do, to let hot things get as cool as possible before building your salads. Hard-boil eggs, toast seeds or nuts, and cook your grains. 2. 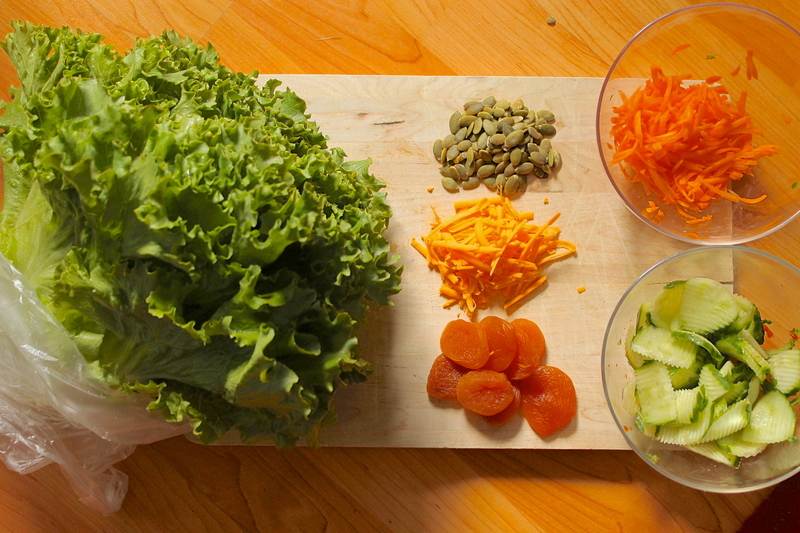 Next do vegetable prep: cut and wash and spin dry your lettuce. Slice or shred your vegetables. Grate your cheese. Wash and chop your fruit. 3. Once everything is prepped, you’re ready to assemble. Line up your jars, and start by putting a couple tablespoons of dressing in the bottom of each one. This is incredibly important, because this is how your salad stays crisp. Then layer in your ingredients starting from the hearty to the more delicate. First up: hearty vegetables: carrots, peas, cucumbers. The next layer is grains. The next layer is cheese, and then proteins. You can also keep the proteins separate, and just throw them in at the last minute, if that makes you more comfortable. Now add your sweet fruits, tomatoes, and your textural component. Your jar should now be about halfway full. Fill the rest of the jar with lettuce. 4. Screw or snap on the lid on tight, and store them in the fridge until ready to eat. That’s it! You just saved time and money, and you have a delicious, healthy lunch for every day this week. What’s your favourite Salad in a Jar recipe? I’d love to hear in the comments section below. I like, no, I love, Greek salad in a jar. Also red potato salad too. Okay! I’m going to have to try those ones! What a great idea. Yes, I am late to the salad- in- a- jar table too, I guess. Thank you. I am eating more and more salad for many reasons and this will help me to continue to eat lots of salad when I get busy again in September. Yum! Awesome! How long will they stay fresh? They’re supposed to stay fresh the whole week! I’ve not yet tested that part of it, though, so if you do, let me know! I don’t know if it’ll work in plastic containers. My guess is, there’s something special about the glass that makes the lettuce last longer??? I need to research… Meanwhile, here’s a greek salad in a jar for ya!